Structural shifts could be subtle, but they weaken your structure and obstruct your electrical system, which can cause many secondary conditions. Schedule a Complimentary Consultation today. Chiropractic care is all about the skeletal structures of the body protecting the delicate electrical system (Nervous system) that coordinates all the cellular functions from your brain to the tips of your fingers and toes. This complex system is constantly being affected by our lifestyles. We sit, we lift, we slip, we fall, we turn and twist. All the while our skeletal system is moving, shifting, bending and protecting the vital structures inside. Our goal at Platinum Chiropractic is to find the kinks and shifts that may have occurred suddenly or developed over time. These structural shifts could be subtle, but they weaken your structure and obstruct your electrical system, which can cause many secondary conditions. There's never a bad time to get checked and corrected, because this is happening constantly throughout our life. It's much easier to keep things normal and in check, rather than wait until you develop problems. If this makes you think of friends or family that you know are suffering from a physical condition that we can help with, share this article. Prevent Injuries causing back pain, neck pain, disk herniations, sciatica, headaches, and so much more. Prevent Injuries that cause back pain, neck pain, disc herniations, sciatica, headaches, joint degeneration, arthritis and so much more. This month's 2nd Tuesday Workshop: Head to Toe Spinal Show. Dr. Karo will be going over how our body's are designed, and meant to work. We will explore ways to decrease your risk of injuries that are causing back pain, neck pain, disc herniations, arthritis, and sciatica, just to name a few. Learn how to move correctly and rehabilitate your body, keep your joints healthy and improve mobility. This interactive workshop will go over common areas of pain and tension, and how to get them better. Space is limited, RSVP to Kristen at info@platinumchiroca.com. What is Neuro-Structural Correction, and how is Platinum Chiropractic different from other chiropractors? Since most chiropractors in this area are of the conventional variety, I think a great place to start would be to define what is considered to be “conventional chiropractic” care. Conventional chiropractic has the following goals. That is what most chiropractors offer in the way of care, and I believe that most of these folks do a great job. Unlike conventional chiropractors, here at Platinum Chiropractic, we focus on Neuro-Structural Correction of the spine by utilizing gentle and specific adjustments in an effort to improve/ correct a neuro-structural shift. We’re all familiar with normal body temperature: 98.6 degrees Fahrenheit. How do we know when someone has normal eyesight? The only way to appreciate abnormal- is to know normal. Now, when it comes to normal we’re not expecting anyone to be perfect. However, if your head is displaced 30mm beyond what’s considered acceptable, you have a neuro-structural shift. Your head shifting forward is no different than your car being forced out of alignment, or the foundation of your house sinking on one side by just a couple of inches. Because the underlying structure has been shifted (regardless of the reason), this deviation of your skull puts abnormal stress on your muscles, tendons, ligaments, spinal bones, and discs- forcing them to put pressure on your nerves and cause secondary conditions (symptoms). We refer to symptoms as secondary conditions because they are a result of a Primary condition or an underlying cause (a Neuro-Structural Shift). Some of these secondary conditions include: Neck Pain, low back pain, headaches, loss of muscular function, muscular tension, nerve impingement syndrome, disc degeneration, decreased energy, and poor sleep, just to name a few. There are four signs that are clear indicators of a Neuro-Structural Shift. These indicators are not related to age or genetics. They are a result of stress, trauma, repetitive movement and improper ergonomic positions that have disrupted the normal function of the spine. They include a moderate to severe shifting of your structure on a structural photograph; moderate to severe nerve pressure on our nerve scans, decreased spinal biomechanics (movement/ motion of the spine), and an abnormal alignment on an x-ray. Our goal is to direct your spine to what’s considered to be normal. By doing so, this will relieve pressure on the discs, which subsequently will relieve pressures on the nerves, thus improving/ correcting the shifts, which are not only causing your secondary condition, but are also inhibiting the optimum function of your nervous system. Here at Platinum Chiropractic, we focus on a specific specialty of chiropractic care called Neuro-Structural correction, not symptom reduction. Structural shifts cause secondary conditions in the body such as pain, tension, poor mobility, and many others. When we correct the neuro-structure, those secondary conditions that are caused by a structural shift tend to go away. We do this by taking many objective measures such as neuro scans, structural photographs, x-rays, and biomechanic testing. The second image is a thermography scan from a patient that has complaints of migraines and lower back pain. She was scheduled for surgery before she came to us. Proprioception refers to the sense or perception of your body position and movement. It’s your subconscious ability to know where your body is without touching or seeing it. This sense is gained primarily from input from sensory nerves in tendons and the fibrous capsules of joints combined with input from your vestibular (balance) portion of the brain. So why is proprioception so important? This special ability allows our bodies to respond immediately to our environment. It is the process by which the body can fluctuate muscle contractions in immediate response to incoming information from external forces via stretch receptors in the muscles which keep track of the joint position in the body. The greatest example we see this is in sports where the body’s ability is impressively displayed. Proprioception works through the nervous system. 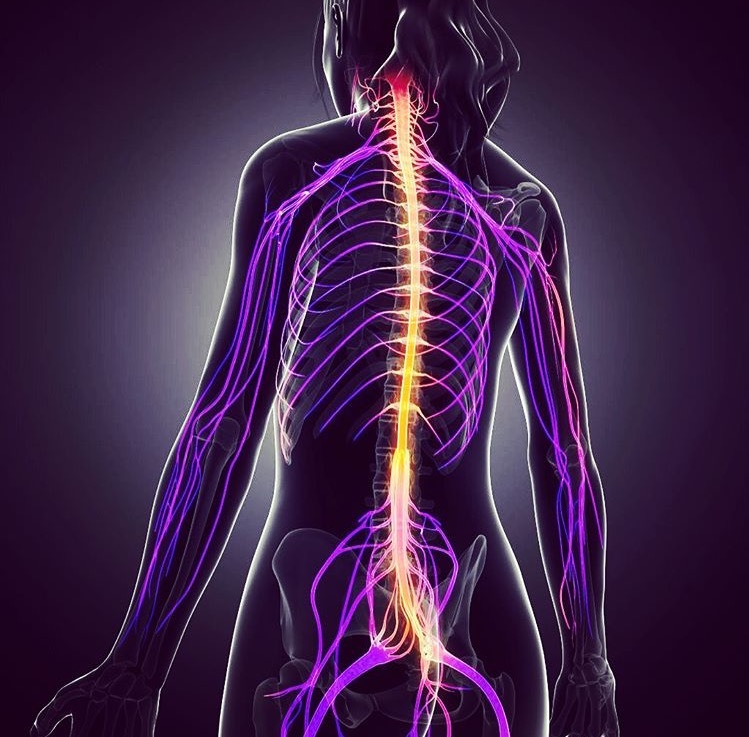 In fact the greatest amounts of proprioceptive connections are in the spine, especially in the upper cervical (neck) area. This is because joint sense and position is so vital to normal function of the brain; we have the most receptors in the spinal column constantly giving the brain feedback of our position and motion. This is one of the reasons why at Platinum Chiropractic we do such a meticulous job of examining the upper cervical spine (neck). We use several objective measures to confirm this area is properly aligned and articulating (moving) normally to ensure appropriate feedback to the brain. When your spine is functioning normally, your brain gets proper information and stays healthy. This can also prevent injuries because the body is much more in tune and responds faster during a slip or fall. Movement and strength are signs of a healthy functioning Nervous System. Your brain is designed to move your body in order to secure resources to maintain health and survival. When we examine people neurologically at Platinum Chiropractic, we are looking at things like their posture, balance, gait, and muscle strength because it gives us an idea about the functionality of their brain. Just think about what happens with things like MS, Parkinson’s Disease, and strokes. They affect our ability to move, but they are not strictly a muscular problem. They are brain problems! In 2014 the European Journal of Preventive Cardiology published a study that suggests that a simple movement test can predict risk of death in middle aged and elderly individuals. 2076 people were studied between the ages of 51-80 and were tracked from 1997 – 2011. Subjects performed a test called the Sitting/Rising Test (SRT). The test is really simple. The subject sits on their bottom and stands up. They are asked to perform the test without using their hands, knees, or sturdy objects. "The SRT test, which can be used on middle-aged and elderly adults, is incredibly simple. Sit down on the floor, and then get up, using as little assistance from your hands, knees or other body parts as possible. For each body part that you use for support, you'll lose one point from the possible top score of 10. "Application of a simple and safe assessment tool such as SRT, which is influenced by muscular strength and flexibility, in general health examinations could add relevant information regarding functional capabilities and outcomes in non-hospitalized adults," the researchers noted. This test is a functional indicator of your strength and basic neurologic fitness. Being able to do this means your brain has good control and your muscles and joints have good fitness and mobility to move your body through space. It’s an indicator that you are fit and have good enough balance to not hurt your self. Rather than focusing on practicing this movement, you should be focusing on getting stronger and having better body balance. It means that maybe you should add some weight training to your weekly routine 2-3 times per week. It means maybe you should take a conscious movement practice like Yoga or Tai Chi to improve your balance and mobility. Remember, you’re not doing these things to prevent death. You are doing these things to raise your health and help you to navigate life with a more functional body and higher quality of living.